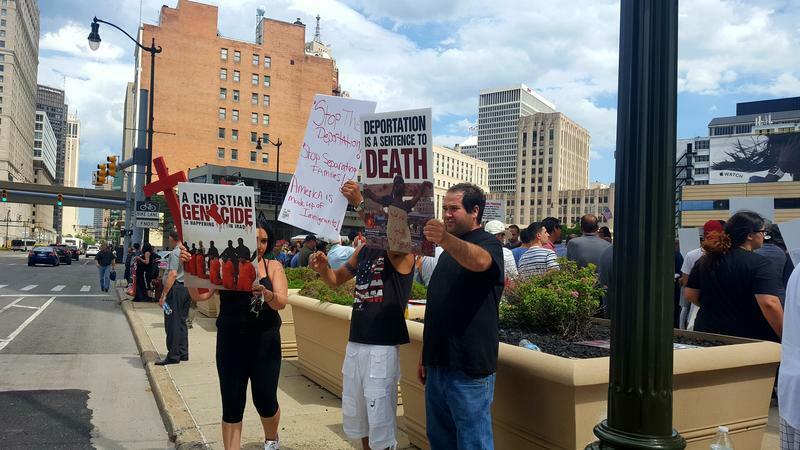 Protesters demand the release of Iraqi nationals picked up in immigration raids in 2017. Many of them (around 1,400 total) had old criminal records, but had served their time and hadn’t been deported because Iraq wouldn’t take them back. And many had been picked up in immigration enforcement raids across Metro Detroit in the spring and summer of that year. In a case brought by the ACLU on the Iraqis’ behalf, Goldsmith stayed potential removals for those Iraqis unless they’d had a chance to plead their case in immigration court. He also ruled that those who didn’t get a bond hearing couldn’t be held in detention indefinitely. But in December, a Sixth Circuit panel overturned those decisions, ruling Goldsmith didn’t have jurisdiction to intervene in immigration cases. By declining to hear further arguments in the case this week, the full court effectively put an end to it. Margo Schlanger is a University of Michigan law professor and a cooperating ACLU attorney for the Iraqi plaintiffs in the case, Hamama v. Adducci. She said the Sixth Circuit overruled Goldsmith on jurisdictional grounds, and didn’t consider the argument at the heart of the case. But Schlanger says it’s unclear whether Iraq is even willing to take these Iraqi nationals back from the U.S. And she said Judge Goldsmith made another ruling prohibiting indefinite detentions that still stands despite the Sixth Circuit ruling. Schlanger says those who have already re-opened their immigration cases, or have already won those cases, aren’t at immediate risk of deportation. They have either won the right to stay or to get their cases heard. One of those “lucky ones” is Sam Hamama, the lead plaintiff in the case. Hamama, an Iraqi national with one criminal conviction from the 1980s, is out on bond and says he’s in line for temporary legal status until a scheduled court hearing in 2020. He plans to seek protection under an immigration rule that allows certain people with certain old criminal convictions to remain in the country. The ACLU says a new appeals court decision will deny people facing deportation the right to make their case in immigration court, even if they believe deportation puts them at risk of death. The 6th Circuit Court of Appeals in Cincinnati has thrown a last-minute monkey wrench into the ongoing legal battle by the ACLU and Miller Canfield to free Iraqis living in the U.S. who were rounded up by Immigration and Customs Enforcement agents in the summer of 2017. This week, U.S. Immigration and Customs Enforcement is expected to release many of the roughly 100 Iraqis it has detained since the summer of 2017. That's after a federal judge gave the government a deadline of December 20th to let them go. In a strongly worded opinion, a U.S. District Judge has ordered the federal government to release Iraqi nationals it has been holding in jails after immigration raids last year.